In a medium mixing bowl, beat together the cream cheese, Greek yogurt, lemon juice, hot sauce, Worcestershire sauce, garlic powder, and salt. With a spatula, fold in the crab meat, jalapeño, half of the green onions, and ¼ cup of the cheddar until evenly combined. ​Transfer the dip to the dish and spread evenly. Bake for 30 minutes. Add the remaining cheese and green onions on top, and bake until the cheese is melted, about 5-10 minutes. 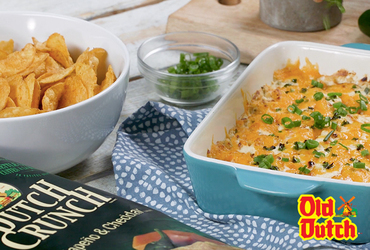 Serve hot with Dutch Crunch Jalapeño & Cheddar Kettle Chips for dipping, and enjoy!